From the time Android was launched, the entire world has started using smart phones. These phones are convenient to use and affordable. The latest trend now a day is an Android smart phone. Android is considered a home to many great applications; it has the huge collection of applications. The work of an Android Web Development is very vital. With so many people using android smart phones to access the internet or the web, you may need to have an Android website of your own. 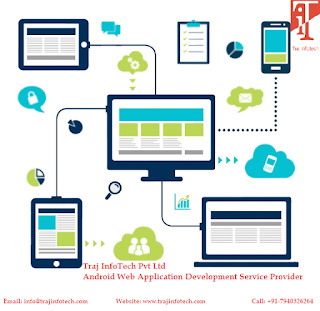 We, at Traj InfoTech help in creating and developing good quality android websites. With so many Android users, there is an increase in web traffic because of smart phones , this is the right time for you to design a web page for an android user. We cannot afford to lose customers who prefer to use android smart phone. It is like a gold mine, for all you know, you might be the first person to tap into it. We follow customer centric approach and an expert and professional team that are talented to create an Android web app. Our Android Web Developers can provide you with a unique android web app. We create and develop web pages and applications as per the client’s requirement. We have created various web applications in different areas such as in business, social networking, shopping, health, sports, audio and music, news, gaming and many more. We have created various applications for different android versions. This helps in ensuring the website and applications created are compatible with all android devices that are available. We have a very unique and adaptable style of creating applications and websites. Our professional team is able to blend innovation and creativity. You can find different colors and styles with different images in our website. We use responsive designs that ensure the website fluctuates according to the screen resolution of the smart phone user. We give a 100% guarantee of competent and smooth website at competitive prices. Try us out and we ensure you will not get unwanted advertisements, disturbing bugs and viruses while using the application. Our Android Web Applications will definitely highlight your brand or product and will also give all your users a wonderful website experience. Developing an application such as a Web Application, it means that you can access the application either through Smartphone or through desktop, but if you develop a native application it would limit this only to a smart phone. An Android Web Application helps you to reach a wider audience. If it is a large organization that has sufficient resources, an Application Development can be done for various mobile platforms, for a small and medium organization, it is important to understand the success or failure. Expected that android will dominate the smart phone market in the world. The advantages of android are easy to build, evaluate, and improve your business and testing the business application. It is a great way to create an Android Web Application and keep all your users engaged. 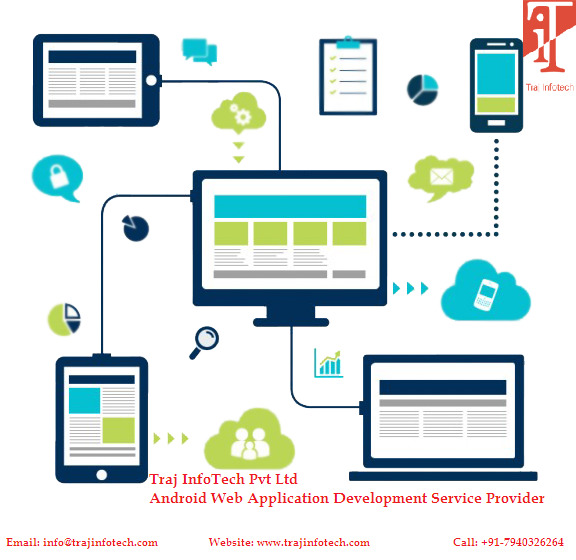 For more details about Android Web Application visit our Website Traj InfoTech Pvt Ltd.